An operation during which a processor can simultaneously read a location and write it in the same bus operation. This prevents any other processor or I/O device from writing or reading memory until the operation is complete. In Java, the reading and writing of 32-bit or smaller quantities are guaranteed to be atomic. By atomic we mean each action takes place in one step and cannot be interrupted. Read current setting of 'value'. Write the new setting back. Threading bugs are difficult to detect and are time consuming. This code snippet might translate into a single instruction on some CPUs and thus work correctly. The problem might arise when tested with other JVMs. Since Java 1.5 the java language provides atomic variables, e.g. AtomicIntegeror, AtomicLong which provide methods like getAndDecrement(), getAndIncrement() and getAndSet() which are atomic. For this simple class, synchronization is an acceptable solution. Now Counter is thread-safe, but the need to use a lock irks some developers because of the performance cost involved. Non-blocking algorithm are usually much faster then blocking algorithms as the synchronization of threads appears on a much finer level (hardware). In the Java language, synchronization coordinates access to shared thread fields and only allows threads holding locks to access and modify variables protected by the lock. This thread’s modifications are visible to the thread that follows, but only after the thread releases the lock. An example is a scenario where thread A holds a lock. A is only able to access and make changes to variables protected by this lock. If thread B holds this lock after A, then only B can view A’s changes on the variables protected by that particular lock. The main problem with locking occurs when B attempts to acquire a lock held by A. In this case, B is blocked to wait until the lock is available. Nonblocking algorithms resolve this problem. The main purpose behind building atomic classes is to implement nonblocking data structures and their related infrastructure classes. Atomic classes do not serve as replacements for java.lang.Integer and related classes. Most java.util.concurrent package classes use atomic variables instead of synchronization, either directly or indirectly. Atomic variables also are used to achieve higher throughput, which means higher application server performance. 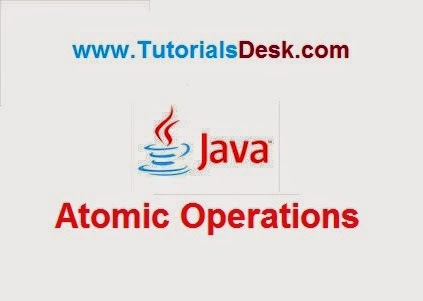 Hope we are able to explain you java Atomic Operations, if you have any questions or suggestions please write to us using contact us form. (Second Menu from top left).